Make sure your camcorder is always ready to shoot with the ACC-V1BP dual charger/AC adaptor and InfoLITHIUM® rechargeable battery kit. 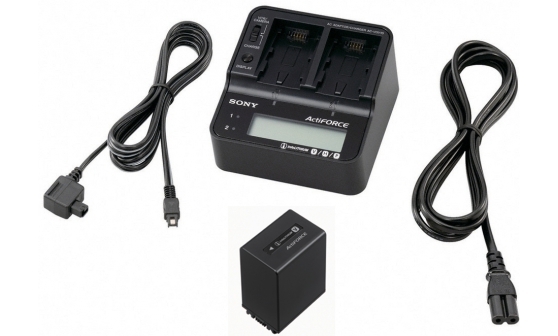 Sony's ACC-V1BP accessory kit includes the AC-VQV10 dual charger / AC adaptor and an NP-FV100 high capacity InfoLITHIUM® battery. This accessory kit offers real flexibility for professionals, giving longer battery life and faster re-charging than ever before. The AC-VQV10 can provide AC power to your camcorder or quickly charge two InfoLITHIUM batteries in sequence. It is fully compatible with InfoLITHIUM V, H & P series batteries. The NP-FV100 high capacity, long-lasting battery powers your camcorder longer than any other battery in the V-series, and has a 15% capacity increase over the NP-FH100. And because it's InfoLITHIUM you'll be able to see the remaining battery life displayed on your camcorder's screen.